Get out your phone, scan the code, and learn. 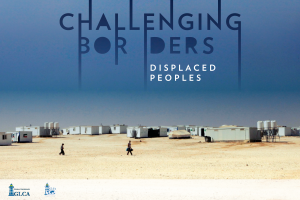 The project, “Challenging Borders: Displaced People,” has much to teach you about those whose lives have experienced disruption and disorder due to immigration, climate change, the refugee crisis and mass incarceration. And the disciplines of art and English and science and psychology and communication all converged to do so, crossing interdisciplinary boundaries in order to challenge you about the ways you view borders — domestic or international — and the people who are affected by them. The best way to take in the “Challenging Borders” project is actually do that: challenge borders by walking the project in its entirety. Traipse to every poster on campus, cross streets, open doors, enter rooms, search hallways, and you’ll feel measures of boundaries as you do. 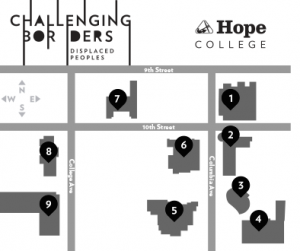 Funded by a $16,000 Global Crossroads Initiative grant sponsored by the Great Lakes College Association (GLCA), of which Hope is a member, “Challenging Borders: Displaced People” is an interactive, 3-5 minute audio-visual diaspora in those campus locations listed above. Nine faculty/student collaborative projects were selected from across divisions to participate so when you scan each poster’s QR code located on its lower right corner, you’ll engage in interdisciplinary sensory and factual uploading. The best way to take in the “Challenging Borders” project is actually do that: challenge borders by walking the project in its entirety. Traipse to every poster on campus, cross streets, open doors, enter rooms, search hallways, and you’ll feel measures of boundaries as you do. And it’s a good way to get in 2,481 steps on your day, too. It’s also a good way to encounter multiple perspectives on the complex issues of migration and displacement gripping our nation and world. You can start at any one of the nine buildings shown on the map above (and identified on a list below). Then think of tackling your walk across campus borders to every project as strolling in a circle, rather than a rectangle, and you’ll begin to feel encompassed and safe inside Hope’s finely groomed green areas and well-kept buildings, a fraught juxtaposition for the images of marginalization and disenfranchisement you’ll soon encounter. As you watch and hear each project depict those who have been displaced and excluded, a needed unease settles in and with it comes the most needed emotion of all: empathy. So, slow down, look closer and stop to challenge borders, but know this: You won’t walk away the same. “I hope the Hope community understands the complexity and importance of these topics and gets a feeling of closeness to the main characters of these videos,” adds Carrasco de Miguel. If walking to every poster in one fell-swoop isn’t within your end-of-the-semester time budget, then take in one project at a time when you happen to be in each building. Slow down, look closer and stop to challenge borders, but know this: You won’t walk away the same.